2-Rail O Scale Railroading: Where's Terry? Where have I been? The short answer is wrapping up my job and preparing for retirement. Don't let anyone tell you that retiring, and retiring properly, is easy. Because I knew that I would be retiring soon, I spent a lot of time where my company needed me, in Indianapolis. I was intending to hang it up in April but, when the company learned that I was serious, they asked me to stay on for another month. When May rolled around they asked that I stay on until the end of June. Unfortunately I had to decline inasmuch as I had plans (as I will outline below). I officially retired May 6. April and May were occupied with getting finances ready for retirement. Since I had income in May (my last check was on May 13), I filed for social security June 1. The biggest problem was signing up for COBRA continuation of my medical coverage. To this day this is still not settled. On May 21, I held an open house at my layout. This was the first session run using JMRI; and it went better than I expected. All trains were run using throttles on tablets. Surprisingly, all members of the group accepted this mode of operation. We also tested the operational theme of the railroad and trains were pushed up both grades using the new F7s from Sunset as pushers. No cars were popped out of trains or derailed. After the open house, I created a list of things that I had to accomplish before I could hold a simple operating session. If I can accomplish this list by about October, I can hold my first op session. So far, I've checked off one item from a list of 15. I have a lot of work to do. June was spent preparing for the NMRA National convention where I was scheduled to give 6 clinics. In addition, I had a major project to finish before the National that would become a race against time. 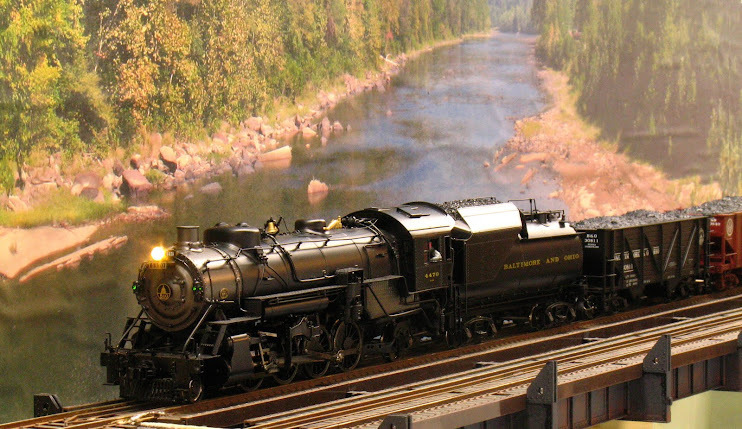 A couple of years ago I realized that our O Scale group in the greater Washington DC area had some pretty nice layouts that exemplified what can be done in 2-rail O Scale. Last April at a meeting of the O Scale Kings, as the membership was bemoaning the state of O Scale, I volunteered to produce a DVD video to promote 2-rail O scale; to be distributed at the O Scale Kings booth at the National. I knew that I had ample material among the layouts in our group. So filming began June 6 and involved travelling throughout suburban Maryland and Northern Virginia and as far south as Williamsburg, VA. Video of Jim Canter's P48 portable layout from 2014 was reused. I developed interview questions for each layout owner to weave a story about 2-rail O Scale. Editing the video was more of a chore than I anticipated and the final cut was completed just 3 days before I had to leave for Indianapolis. Two of those days were consumed reproducing 100 disks using every available computer that I could lay my hands on. Distribution of the disks at the National did not go as planned, inasmuch as the O Scale Kings could not get their booth to the convention. However the disks were distributed at Jim Canter's layout on display at the convention; and several influential people received a copy. Whether they watched the video is another matter. So here is the video for your enjoyment. Adjust the resolution up if you have a fast computer and internet connection. Please leave feedback. What a great video. I am quietly drawn towards 2 rail O scale. The thought of a P48 switching layout always pops up in my mind. After see the Jim Canter section of this video, and recently driving around in a car with Jim Lincoln for a few hours just reinforces those thoughts. Go for it! Start small, buy equipment in the secondary market. We can give you all of the help that you need. Awesome!! I really like this blog, thanks for sharing. Hope all is well. Enjoyed reading about your railroad. You must have made some great progress since your last update. Hope you'll share that with us. Thanks!